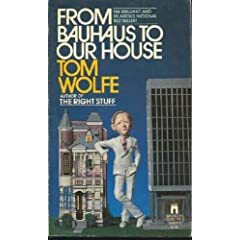 Many people agreed with Wolfe‘s opinion on Modern Architecture, so in 1980 he set out to tell the story of how it came to be that way. He describes the origins of the Bauhaus in Weimar Germany, follows the protagonists to the USA, and highlights how their ideas spread from the architectural schools where they were given professorships. He also talks about the architects who did not subscribe to their ideas, and became anathema to the architectural world. A neat story revolves around Edward Durell Stone, who built the original MoMA in New York, but -after finishing the ornamental and luxurious American embassy in Delhi- became an architectural outcast, and wasn‘t allowed to add to his own building when MoMA later expanded. He did get to design the Huntington Hartford Building on Columbus Circle, though, which for a while housed an art museum meant as a counter-weight to MoMA. Starting with the Bauhaus folks, much 20th century architecture -like 20th century art- involves theories of various kinds in which one can (or must) believe. Wolfe presents those too, without (thankfully) going into too much detail of what sometimes are very theoretical and academic discussions on what architecture can and should be. He does address the repercussions of the theories with respect to actual buildings, though. The book ends in the late 1970s, when a number of architects began to deviate from the prevailing fashions, and Postmodern Architecture starts to take root, notably with the commission of Michael Graves for the Portland Building. This entry was posted by Ulf on Thursday, July 3rd, 2008 at 11:47 pm	and is filed under Uncategorized. You can follow any responses to this entry through the RSS 2.0 feed. You can leave a response, or trackback from your own site.